You may think this is another one of my wonderful metaphors about navigating the slippery world of the Internet, however you would be wrong. Believe it or not this is actually an article about how to drive a car on ice and snow! I was recently surprised by a friend who told me that they had no idea about driving on ice and that it terrified them. I must first say that I am NOT a driving instructor of any kind, neither am I qualified to offer training/advice in this subject – I have however had a little experience of driving on snow and ice and actually rather enjoy it, so I though it might be helpful to share this for the benefit of those like my friend. If you want full winter driving training then you should seek the services of an advanced driving instructor and not listen to the ramblings of an idiot like me. First and foremost you just need to sloooow it all down a lot. If you do everything at half the speed you will have twice as much time to think! You should allow at least three times more space than usual between you and any vehicle in front of you. Turn on your lights (dipped) to increase your visibility to other motorists. Keep your lights and windscreen clean. Plan your route carefully and check the latest weather forecast. It’s also a good idea to keep a breakdown kit (warning triangle, torch, blanket, chocolate bar) in your car in case of emergency. Membership of a breakdown service is also advised. Don’t overtake snowploughs and gritting lorries. The drivers have limited visibility, and you’re likely to find the road in front of them worse than the road behind! 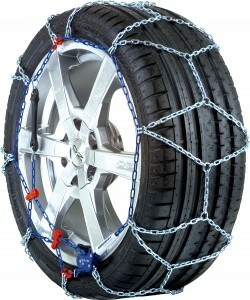 If you have snow chains, use them! On any car the only thing keeping you attached to the road are four small (about the size of a paperback) patches of rubber, one at the base of each tyre. The key to driving on ice and snow is maximising this grip at all times. There are a number of things that will reduce this grip. Firstly, as I said above, poor maintenance of your tyres will reduce your chances of successfully navigating a slippery surface. But another thing that reduces grip and increases you chances of losing control is poor driving! At rest, a car’s weight is evenly distributed over those four bits of rubber I mentioned, but, if you accelerate too harshly, brake too hard or corner too fast you will shift the vehicle’s weight distribution. In most cases this will be the starting point for trouble. By simply slowing everything down and doing everything in very deliberate, smooth movements you will decrease your chances of loosing control. Accelerate gently and maintain constant speeds in lower gears than usual. Try and use downshifts to aid braking rather than using the breaks on their own. Keep both hands on the wheel and steer slowly and smoothly, this will help you maintain control. Try not to do two things at the same time, slow down before you have to take that corner rather than breaking AND steering at the same time. Keep breaking pressure constant and smooth, if you feel the wheels locking lift off the brakes, downshift and pump them gently until you slow down. If you have anti-lock brakes (ABS), do not pump the brakes. Apply steady pressure to the brakes. You will feel the brakes pulse — this is normal. Recovering from a skid is not an easy task and in most cases (especially for a novice) it will result in loss of control. It is far easier to try and avoid skidding in the first place by using the techniques mentioned above. There are basically three types of skid you might experience, the first two usually happen whilst cornering. These are called “Under-steer” and “Over-steer”. Most modern vehicles are front wheel drive and, as such, are more likely to under-steer. 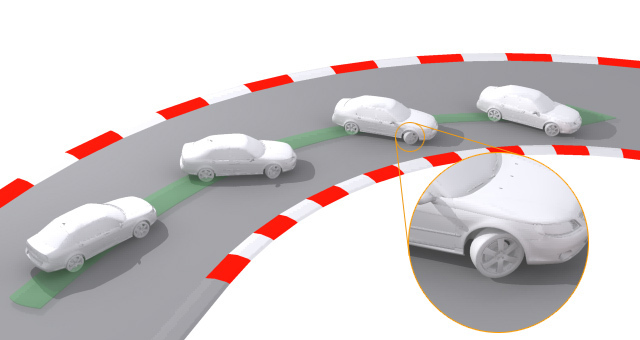 To put it as simply as possible, under-steer is when you turn the wheel to go round a corner but the car doesn’t turn, it merely slides in the original direction. This happens because the cornering speed is too fast for the amount of available grip. The normal reaction when this happens is to either brake hard (which just compounds the problem) or to try and steer harder, this can lead to the car then over-steering, fishtailing and eventually spinning. The best way to correct under-steer is to lift off the gas, downshift and wait for the speed to reduce to a level where the grip returns. Over-steer usually happens in rear-engine or rear-wheel-drive cars, it can sometimes occur in a front wheel drive car as I mentioned above. As with under-steer it occurs when cornering too fast. During these skids the rear of the vehicle begins slide away from you as you corner, if left unchecked it would result in a full spin. The way to correct over-steer is to turn into the skid i.e. 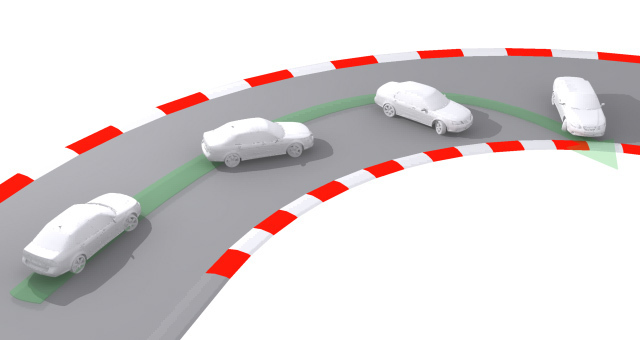 if you are making a right turn and start to over-steer, turning the wheel to left will correct it. This is called “counter-steer”. Be carful not to overcook it though or you might end up over-steering in the other direction. As with under-steer, lifting off the gas to slow the car will help with correcting the skid. The third type of skid is caused by braking too heavily. If you are travelling too fast on ice or snow and try to stop too harshly, the wheels will lock and the car will continue travelling in whatever direction it was pointing at the moment you applied the breaks. In this type of skid you become a passenger in the vehicle and no amount steering will change the inevitable truth that the car will keep going until it runs out of kinetic energy, in most cases this will be when your car hits another, less mobile, object! The only thing you can do is lift off the brakes, downshift and pump the brakes gently. With ABS brakes this type of skid should not occur. The safest drivers are usually the most confident ones (not over-confident), they have confidence because they understand both what they and their vehicle are capable of doing. Most importantly they also understand what they are not capable of! This confidence can only really come through experience. Although I urge you not to take unnecessary risks, I would also advise you to at least try and put some of these principles into practice if you have the opportunity. If you simply don’t have the chance to do this or wouldn’t feel safe, you can take specialist driving courses that can teach these skills in a safe environment. Better to be prepared and never need them than to need them but not be prepared! In winter conditions and especially in conditions where roads are packed with snow, no amount of “good driving” will be enough. Sometimes you will need additional equipment to redress the “grip” imbalance. Winter tyres, snow chains and snow socks all work in a similar way by increasing the amount of physical grip available to you. Winter tyres work by increasing both the tread depth and modifying the tread pattern to help the tyre “cut-in” to the snow more effectively. The tread pattern is also designed to prevent snow from packing into the grooves (a common reason for lack of grip with normal road tyres). Additionally, winter tyres are made from a softer rubber compound, offering more physical grip even on roads without snow or ice. If you are thinking about fitting winter tyres it is worth remembering that even in low temperatures they will outperform a normal road tyre. Some people buy a second set of standard wheels fitted with winter tyres to put on during the winter months – this avoids having to pay to have your tyres refitted twice a year! Without doubt, chains are the ultimate “get-out-of-jail” card you can have in heavy snow or pack-ice conditions. But there are a number of things to consider before buying a set. Firstly, and I know it seems obvious, remember that snow chains come in different sizes for different tyres! This is important as it means that your chains will fit the car you buy them for but won’t necessarily fit your wife’s car or your company car. Secondly, remember that there are different types and ratings of chain, each is either designed for differing vehicle types or ease of fitting. Prices vary from £30 for a basic pair to £500+ for a set of quick fitting, auto-tensioning chains to fit a large 4WD. Whichever set you buy remember to always follow the manufacturer’s instructions when fitting them. For most modern cars a pair fitted to the front (drive) wheels will be sufficient. Rear wheel drive cars and 4WD vehicles will need chains fitting to ALL wheels. Again, this may seem obvious but always make sure you have practiced putting your chains on and taking them off again BEFORE you need to use them – trying to work out “how do these things go on?” at the side of the road in a blizzard may not be the best idea. Also remember that as soon as you get to clear tarmac you must remove them to avoid damaging the chains. Drive smoothly (Never over 30mph) and try to change gear as little as possible. 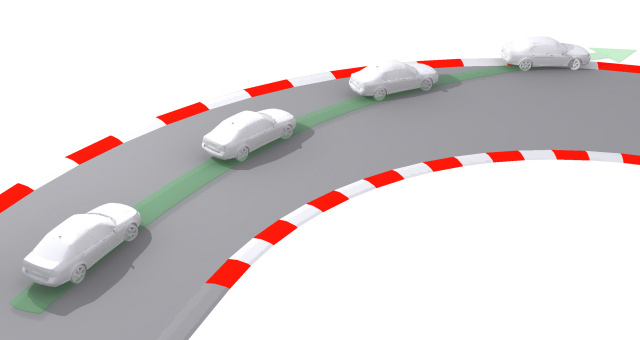 Always avoid cornering at excessive speed, dangerous overtaking, sudden acceleration and sharp braking or skidding. Never spin the wheels, since this will seriously reduce the life of your snow chains. Other than this, it is my experience that you can drive pretty much as normal on packed snow whilst using chains. Periodically inspect the links for signs of wear. In the event of any defect or breakage, stop immediately and remove/repair the chains. After use wash your snow chains with warm soapy water and dry before storage. Always store in a dry environment. Snow socks for tyres are billed as a cheap alternative to snow chains that will help get you home if there’s sudden snowfall. As the name suggests, you pull the sock over the wheel and tyre of your car. Unlike conventional snow chains, tyre socks have no metal parts. Instead, they are coated with a strong textile surface with fibres arranged at a right angle to the direction of travel to optimise grip on the road. 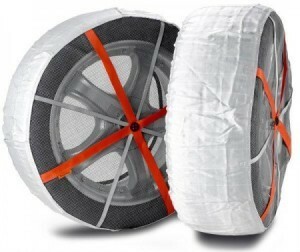 Fitting snow socks to the drive wheels of your car should give it more grip on snow and ice. This is because dry snow and ice sticks to the textile surface of the snow socks, generating greater friction between the slippery road and tyre. One thing to always remember is to remove the snow socks as soon as you reach gritted roads, as the tarmac will shred them. Remember as with chains, if your vehicle is rear wheel drive or 4WD, you should fit socks to all four wheels.